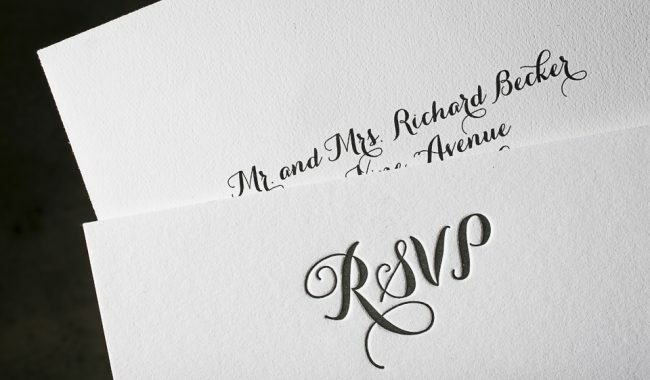 Letterpress and digital offset invitation suite. Letterpress and digital offset printing. Crane’s Lettra 220# and 110# cover (invitations and inserts) and envelopes in fluorescent white. Mohawk Superfine Ultra White Smooth 80# text with i-Tone (envelope liners). Neutral Black and Cool Gray 8 letterpress inks printed on our Heidelberg Windmill 10 x 15 + CMYK digital offset printed on our HP Indigo 5600.
the invitation suite: We worked with Rietje to print this invitation suite for Emily and Sasha’s summer wedding. 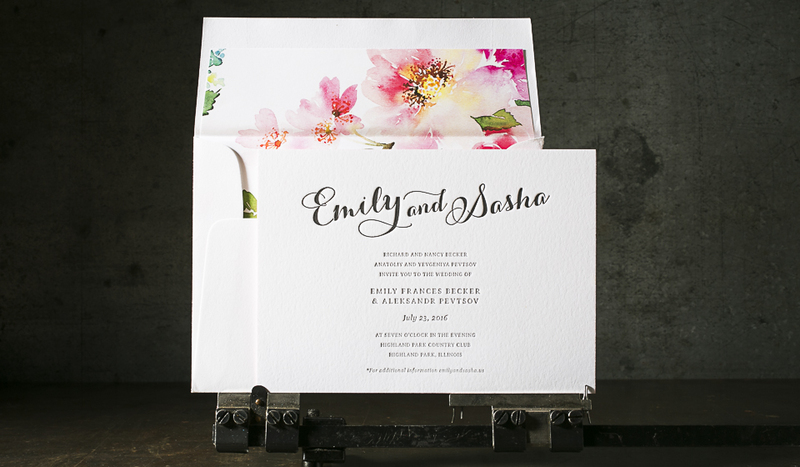 We love the way she used a CMYK floral pattern and edge painting to add pops of color to the mostly letterpress suite. 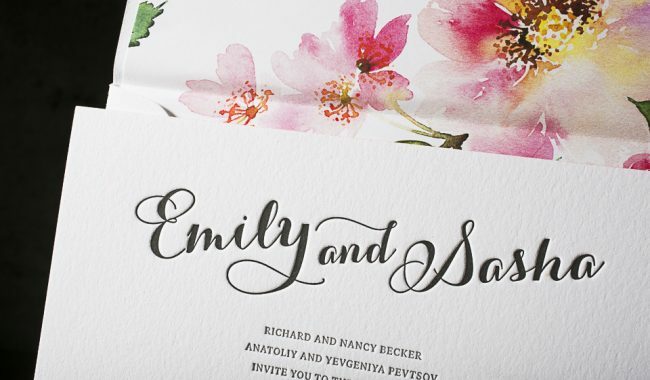 The invitations (4.5 x 6.25) featured 2 letterpress inks on 220# Lettra and edge painting in a pretty pale pink. 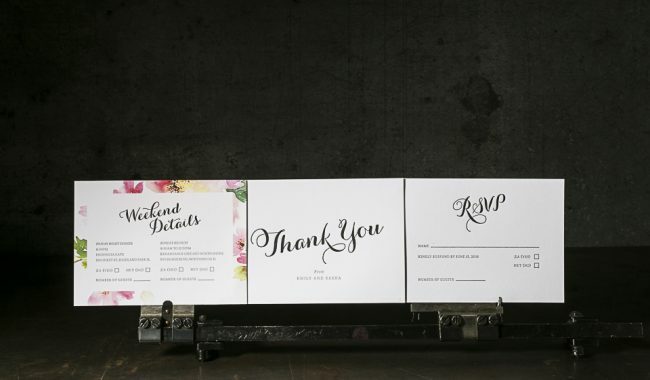 The reply and flat thank you cards (3.5 x 4.875) were letterpressed in 2 colors on 110# Lettra. 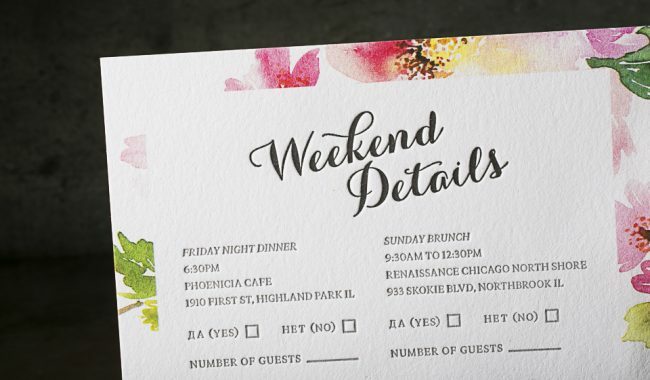 Rietje added a CMYK digital border to the weekend details card (also 3.5 x 4.875 and 2 color letterpress). The same CMYK floral pattern lined the A6 envelopes.